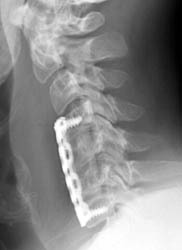 The patient is a 46-year-old male who had undergone the corpectomies of C5-6 and discectomies at C4-7 with anterior plate fusion and bone grafting for cervical myelopathy resulting from cervical stenosis as well as kyphotic deformity. Thereafter, the patient noted increased spasm of his right arm as well as right leg. 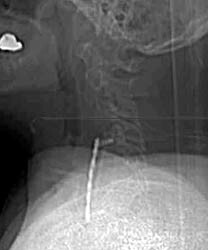 Work up revealed that the patient had dislodged the inferior portion of the bone graft as well as the plate. Scout image from a CT obtained 3 months later suggests ventral displacement of the bone graft and fixation plate. 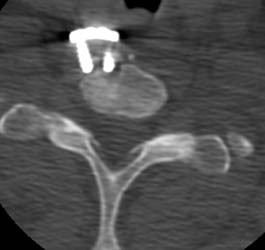 This axial CT taken at the same time shows to better advantage how the distal screws are fully out of the ventral cortex of C7 on the right hand distal screw and only 1 thread of the left hand distal screw remains in the bone itself. The fixation plate is also 1cm ventral to the body of C7 at this level.